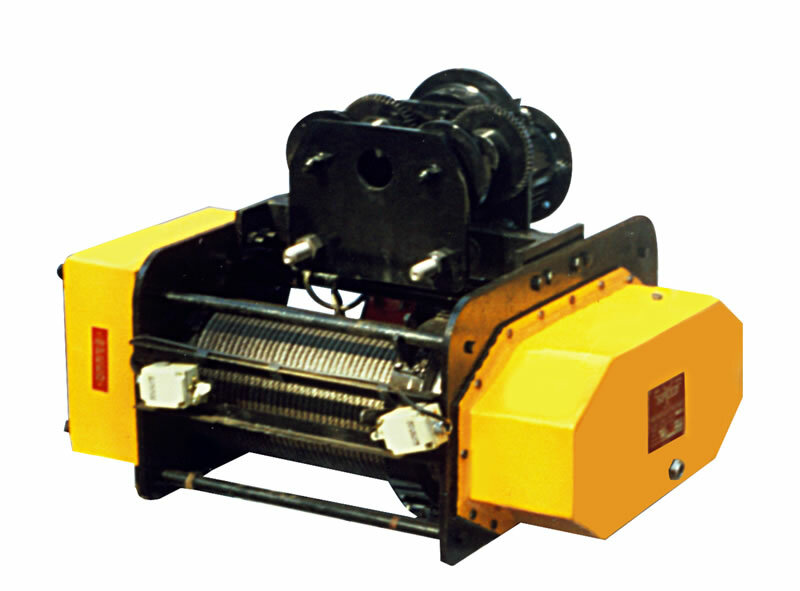 SPEED WIRE ROPE ELECTRIC HOIST: Is the true and most reliable solution for material handling problems. The standard designs are suitable for class II applications, as per IS:3938, i.e for medium duty applications. However class III or IV hoists are available on order. The accompanying charts give standard capacities and lifts, but higher capacities and lifting heights, are available on order.Also FLAME PROOF HOISTS. Following are some highlights of this versatile machine. ROPE DRUM:- Is Made out of seamless pipe, of sufficient thickness. The grooves are very accurately machined on it, which ensures proper sitting of wire rope in it. It is supported on Ball Bearings, by high tensile steel adaptors. ROPE GUIDE:- It prevents the rope from overlapping on drum, and guides it accurately to the grooves. It is designed, so as to enable easy removal, for maintenance purpose. It also guards against slackening of rope on drum. GEAR BOX:- Specially designed gear box is attached to the frame. It transmits power from motor, to the drum, with the greatest possible mechanical advantage. The Gears are of special Alloy Steel. They are precisely machined, hardened and tempered, or longer life, with smooth and noiseless running. SUPPLY VOLTAGE:- 440V.3 phase, 50c/s. CONTROL VOLTAGE:- 24V (for operator safety). IMPROVEMENT:- Our design personnel, continuously makes efforts for improvement, And we reserve the right of affecting and change, found necessary without any notice. TESTING:- The hoist components are subjected to strict quality control procedures. And the hoist is finally tested to 25% overload. GUARANTEE:- A guarantee is provided, for the repair and replacement - F.O.R. - Mumbai, of any part, which proves defective, in material or workmanship, within 1 year of sale. HOOKS:- The Alloy Steel, forged, heavy duty, hook, is supported on thrust bearing, in the bottom block frame, which is robustly fabricated. TROLLEY:- The trolley can be adjusted to different beam sizes. The trolley wheels are made of steel, having a perfect Curve to enable running, with minimum friction on beam. BRAKE:- Specially designed for hoist application, fail safe, electromagnetic disc type brake, ensures complete safety at any hoisting position. These Brakes are self adjusting, for wear. ELECTRIC MOTOR:- Special Hoist duty motor used, with class B insulation. Thses are suitable for more than 100 starts and stops per hour. BUILT IN SAFETY MEASURES:-(A) Limit switches provided, to stop the hoist immediately, as soon as the maximum hoisiting or lowering limit is reached. Thus preventing any mechanical damage to the equipment. (B) A Bi-Metal relay, protects the equipment, against single phasing of supply voltage. ELECTRICAL CONTROL PANEL:- This is enclosed in a box. Which is weather and dust proof. It houses, the best and most reliable quality components. PENDANT PUSH BUTTON STATION:- Suitably designed to, reduce operator fatigue. It is robust, heavy duty, dust and vermin proof, suspended by a strain cable, to take its full load. Capacity K.g Lifting Height mts. No. of Rope Falls Hoisting Speed mts.min. Hoist Motor H.P C.T Speed mts./min. C.T Motor H.P Appr Weight kg. Wire Rope Dia.mm. Trolley Flange Width mm. Dimensions given above are for HOIST WITH MOTORISED TROLLEY.Other Models available are : HOIST WITH FIXED SUSPENSION AND HOIST WITH HAND GEARED TROLLEY. Lifting heights specified above are standard, however, higher lifting heights, are supplied on request.